Both of these classes of framing are used for the purpose of light, either fixed in the roofs, flats, etc., or forming a roof in themselves. Their object is to give light from above, where, from various causes and circumstances, the enclosing walls cannot be used to supply that want. A skylight is the smaller of the two, and is generally flat in form, and inclined with the pitch of the roof; whereas a lantern has vertical or only slightly inclined sides, which are often framed with casements made to open, in order to give ventilation in addition to light, the whole being covered by a slated, tiled, or glass roof. Fig. 858 represents a skylight in section, Fig. 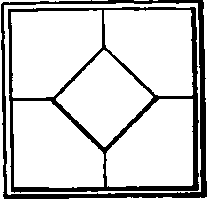 859 the elevation in a slated roof; but only the woodwork will be dealt with in this chapter, no notice being taken of tiling, slating, or leadwork. The student ought to be well acquainted therewith, as they have been explained in previous chapters. The roof rafters, etc., are first of all trimmed to suit the size of the skylight required, and a curb is framed together and wedged up within that space. 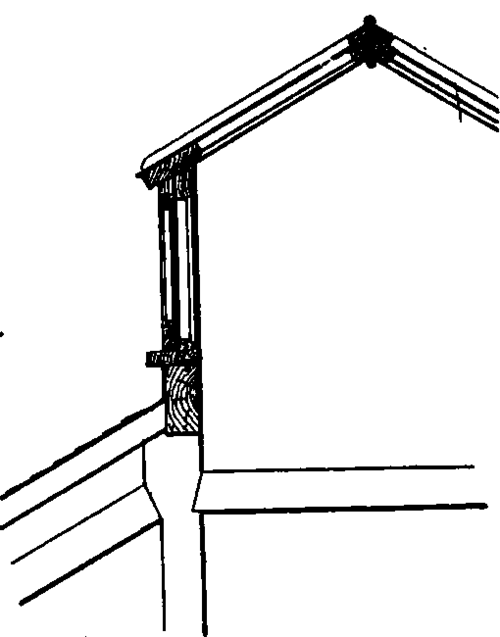 The angles of the curb are either grooved and tongued, or dovetailed together; and, in a slated roof, the curb should be 9 inches deep, to allow of a gutter behind it at the top part, as in Fig. 858. In a tiled roof, however, the curb should be 11 inches deep, the increased depth being necessitated by the extra thickness of tiles as compared with slates. The tiles at the eaves of the gutter, which is at the top of the skylight, with a 9-inch curb and ordinary rafters, etc., would almost touch the bottom of the toprail of the skylight, and would not allow of a sufficiently large gutter, especially for snow, hence the necessity for 11 inches. The 9 and 11-inch curbs are measured from the underside of the rafters, and if these are of more than the ordinary depth of common rafters, the depth of the curb has to be increased accordingly, but the above are the usual sizes -i.e., 9 and 11 inches deep by 1 1/2 or 2 inches wide. 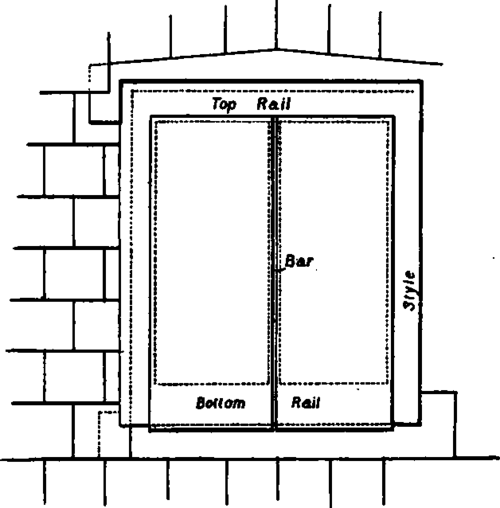 The top of the curb is tongued, to fit a groove around the underside of the skylight, which is a framing of styles and rails, with bars for the glass, running in the direction of the roof, and framed into the top and bottom rail, as will be gathered from Fig. 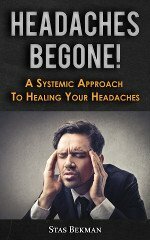 859. Fig. 860 is an enlarged detail of the top and bottom of Fig. 858, from which it will be seen that the bottom rail is not as thick as the top one, being 3/4 of an inch, or the depth of the rebate, less. This is done in order to allow the glass to run down over it and project over the bottom edge of the bottom rail, so as to throw the rain-water off. Otherwise, if the bottom rail were to be made of the same thickness as the topnul, a gutter would be formed, and the rain would soak through the putty and drop inside;and in snowy weather it would form an excellent lodgment for the snow, as shown on Fig. 861. The styles are as Fig. 862 in section, and the rails are tenoned and wedged into them at the angles. 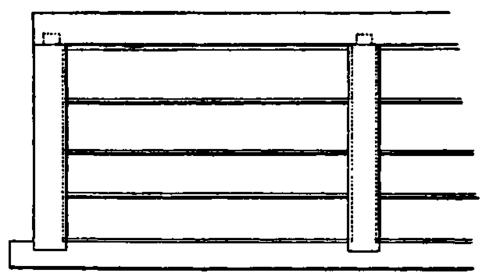 The bars (Fig. 863), which are fixed about 12 to 15 inches apart, are, of course, of the same moulding as the styles and rail, and of the same depth as the styles and toprails, but 1 1/2 inch wide, and framed at each end into the top and bottom rails. The bars may be moulded to any section, chamfered, or square; and in best work they are checked out a second time, and grooved underneath the glass, as Fig. 864, to allow the condensation which collects on the underside of the glass to run down the bars and out. Skylights can be either fixed or hung; and in the latter case they are hinged by butts at the top, and opened at the bottom upwards by a patent lifting apparatus (Fig. 865). The glass of the skylight is kept in position by light narrow copper clips screwed to the rails, underneath the glass, which they clasp at the bottom as in Fig. 866. 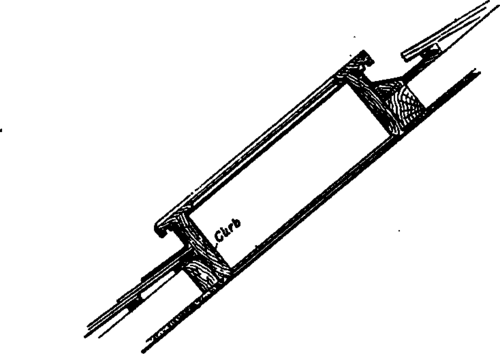 The glass ought, if possible, to be in one length; but when that is not possible, these clips, with another bend in them, are also used to keep the top pane (which laps over the others) in position, as Fig. 867. In common and very large fixed skylights, over sheds, etc., no curbs are used; but a head and sill to the required section are fixed to the ends of rafters longitudinally, the styles being framed into them at the ends, and the bars stumped into the head at the top, and notched into the sill at the bottom, as Fig. 868, which illustrates such a skylight in any position intermediate between the ridge and the eaves. Fig. 869 shows a similar skylight, placed close up to the ridge itself, which also may be differently treated, as shown in the enlarged section (Fig. 870). Lanterns are generally formed at the apex of a roof, as Fig. 871, or on a flat, as Fig. 872; their roofs having either gable ends, as Fig. 873, or being hipped, as Fig. 875. The top or roof part of the lantern (Figs. 871 and 872) is precisely similar to an ordinary skylight, consisting of bars, styles, sills, and heads framed together; the heads of the two sides meeting at the apex, against ridge pieces, as Fig. 873A, the section at the sill being as Fig. 874, which also shows the upright framing of a lantern on a roof. Fig. 873A. Curb or bearer. The hipped roof (Fig. 875) is built up of bar rafters, hip and jack bar afters, framed into the head at the ridge, and at the sill they are treated as Fig. 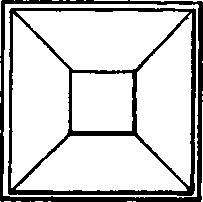 875A, which otherwise represents a lantern on a flat (vide also Fig. 872). The side framing consists of four angle posts, framed into head and sill, with intermediate mullions, the whole rebated out for, and filled in section with moulded casements, either fixed or hung, according to requirements, the casements being sometimes hung on centres, or pivoted, as hereinbefore explained. It is needless to give details of these angle posts, mullions, and casements. The student will be able to form his own details from the illustrations, etc., already given in the chapter on solid frames and casements. 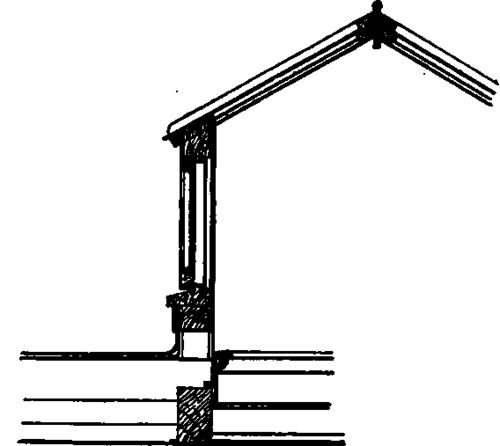 In lanterns for common shed roofs the side framing is often filled in with louvres instead of casements, to give egress to the hot air or steam as shown in Fig. 876. The ends of the louvres are housed into the posts or mullions, as Fig. 877. Ceiling Lights arc often used, in connection with fixed skylights, to bring the light into the rooms, and still have a flat ceiling. The ceiling rafters are trimmed, and a curb is wedged inside it, rebated out at the top for the casement, which is of the ordinary section and class (vide Fig. 878). The bars may sometimes be constructed and arranged to some geometrical or ornamental designs, as Figs. 879, 880.